As many Kenyan observers, locally and internationally will admit, and in terms of causalities, the Garissa Terorrist attack on 2nd April 2015 in which 148 students were butchered mercilessly by Al Shabaab terrorists was worse that the Westgate terrorist attack in which 67 people murdered in cold blood. 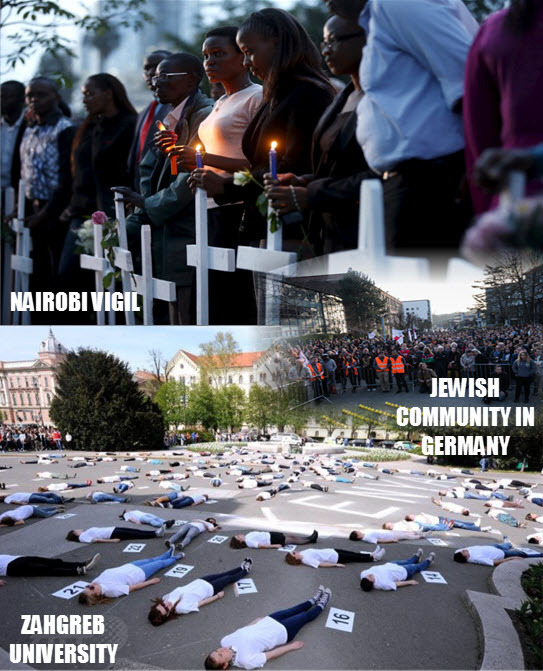 Following the Garissa attacks, prayers and memorial services have been organized in Kenya and in certain countries around the world like Germany and Japan. In memory of the departed souls, the Kenya Christian community in Stockholm is inviting all Kenyans, friends, sympathizers, well-wishers and people of good will to a Memorial Prayer session on Wednesday, April 22nd 2015 at St Klara Church from 19.00 hrs sharp. The event is being coordinated by Pastor Beatrice Kamau and Sister in Christ, Sheila. The two women of God (who have devoted their services to the Church) have, in the past, been in the fore-front in condoling with bereaved families, coordinating solidarity Prayer meetings with those in need and helping the helpless. Following the Westgate attacks, a similar Prayer session was held for the victims at St Klara with Pastor Beatrice and Sister Sheila in the Engine room. Speaking to KSB, an Embassy official said that the Embassy was aware about the event and that Ambassador Joseph Sang will attend in solidarity. “We have been informed about the event officially and the Kenyan Embassy supports it”, an Embassy official told KSB. For further information, contact Pastor Beatrice at 0739259234 or Sister Sheila at 0736667875. At KSB, we continue to pray for the families and hope that God will rest the souls of the departed in eternal peace.